In the castle of Fontainebleu Napoleon forced the Pope to give up the States of the Church, promising an annual income of two million francs. In the same castle Napoleon was himself later forced to sign an abdication and was promised a yearly income of the same amount. When the Pope excommunicated Napoleon, he answered that the words of an old man would not make the arms drop from the hands of his soldiers. In the Russian campaign, because of the intense cold, this actually happened. He kept Pius VII prisoner for five years; he himself was later a prisoner for seven years. Four days after ordering the union of the States of the Church with France, he lost the battles of Aspern and Erlingen. What was the end of the leaders of persecution, schism, and heresy? –Many of the leaders of persecution, schism, and heresy came to a bad end. Of the first persecutors, several died violent deaths. The death of Judas is the type for his imitators. It is related that: Herod, the murderer of the Holy Innocents, died in unspeakable tortures. Herod, the murderer of James the Apostle, was devoured by worms. Of the persecutors in Rome, Nero was deposed, and in despair stabbed himself. Marcus Aurelius, despondent over the ingratitude of his only son, starved himself to death. Septimus Severus, whose life had been attempted by his only son, died in despair. Decius died miserably in a swamp, during a battle. Valerian was flayed alive by the Persians. Maxentius was drowned in the Tiber. Diocletian died from a loathsome disease. The case of Napoleon is instructive. Drunk with power, Napoleon seized Rome in 1808, declaring himself the “successor of Charlemagne”. He banished Cardinals and bishops, and carrying off Pope Pius VII, held him prisoner in Savona. Enemies of the Church exulted: “The Papacy is ended! The Emperor has devoured the Pope!” They forgot the divine promise to Peter: “The gates of hell shall not prevail!”; on that promise was based the ancient saying: “Who eats of the Pope dies like a beast.” On the same day that Napoleon died in exile at St. Helena, Pope Pius VII was celebrating his own feast day in Rome. Heretics and schismatics have shared the same fate. Arius burst asunder during a triumphal procession. Voltaire died in despair. The Greek Schismatics fell under the Turkish yoke in 1453, on Pentecost, the feast of that Holy Ghost about whom they had expressed doubts.Truly history has shown the truth of the words of Holy Scripture; “It is a fearful thing to fall into the hands of the living God” (Heb. 10:31). Why can no other church except the Catholic Church be the True Church of Christ? –No other church except the Catholic Church can be the True Church of Christ, because no other church possesses the marks of unity, holiness, catholicity, and apostolicity.Truth cannot change; hence the constantly changing doctrines of non-Catholic churches can not be true. They also differ in their government. Some recognize the temporal ruler as their spiritual head. Others have ministers whom they call bishops, deacons, elders. The majority reject such titles. There are hundreds of churches and Christian denominations, each different from the others; they do not possess the mark of unity. They differ in even the essentials of faith. They cannot agree, and keep dividing and subdividing year by year. Their only similarity appears to be their opposition to the Catholic Church.Such churches are multiplying. In the United States there are over two hundred religious bodies. They arise, then pass away, to give place to other denominations. Realizing the great handicap of disunity, efforts have been made by various groups of churches to organize. General councils and conferences of different bodies have been held; but there is no vital result for unity. This is of course because, though agreement may be general concerning matters such as social work, beneficent societies, and the like, no agreement can be found in the essentials of faith and doctrine. This is the result of free interpretation of the Bible, and the repudiation of Peter’s successor, Vicar of Christ. The denominations and their founders are not holy in the same sense or degree as the Catholic Church and its Founder are holy. Many non-Catholics are upright and good because they have retained many doctrines and practices of the Catholic Church.Many founders of non-Catholic churches were far from holy. Luther, the founder of Protestantism was an apostate friar, who married a nun who had left her convent and turned against her vows. During his life he taught contradictory doctrines, some of them immoral. Henry VIII, the founder of Anglicanism, married five women successively, after divorcing his lawful wife; he had two put to death.No denomination is catholic, or universal. These non-Catholic churches are everywhere, but are different everywhere.A regional or national Church cannot be the true Church, since it cannot teach all nations, as Christ commanded.No heretical Christian denomination is apostolic. The Protestant churches are some 1500 years later than the Church founded on the Rock of Peter.Not even their teachings come down from the Apostles. Their ministers cannot trace their succession from the Apostles. Not one teaches all the doctrines of the Apostles. How then could they be the Church founded by Christ? What should be the attitude of Catholics towards those who do not belong to the True Church? –Catholics should observe an attitude of understanding towards them, because the majority of those who do not belong to the True Church are in good faith. Catholic teachings are not easy to understand at first sight; many Catholic practices require sacrifice. Towards such a religion there is bound to be prejudice.To be obliged to go to Mass every Sunday under pain of mortal sin; to have to confess to a priest, who is another human being like ourselves; to condemn divorce and birth control; to observe fasts and abstinence;-these are not easy doctrines.No wonder in looking for relief, man often, however unconsciously, seeks motives for not accepting the Church that commands its members to obey such precepts, to accept such doctrines.When Our Lord first announced the institution of the Holy Eucharist, many of the disciples said, “This is a hard saying. Who can listen to it?” (John 6:62). And they no longer went with Jesus. Catholics should above all try to give good example; nothing is more effective in the eyes of non-Catholics than the exemplary lives led by good Catholics.“Behave yourselves honorably among the pagans; that, whereas they slander you as evildoers, they may through observing you by reason of your good works glorify God in the day of visitation” (1 Peter 2:12). Catholics should often pray for the conversion of those outside the Church, praying with the Good Shepherd for only one Fold. While avoiding useless discussions that generally end in bitter quarrels, Catholics should try to show the beauty, the truth of the Catholic Church.In our friendly discussions with non-Catholics we should not be always on the defensive, but should try to see whether they can trace the origin of the authority of their ministers to the Apostles, whether their church can be proved the True Church by the possession of the four marks. Often our non-Catholic friends criticise the Catholic Church on account of some devotional practices like holy water, candles, etc., as if such practices belonged to the essentials of faith. 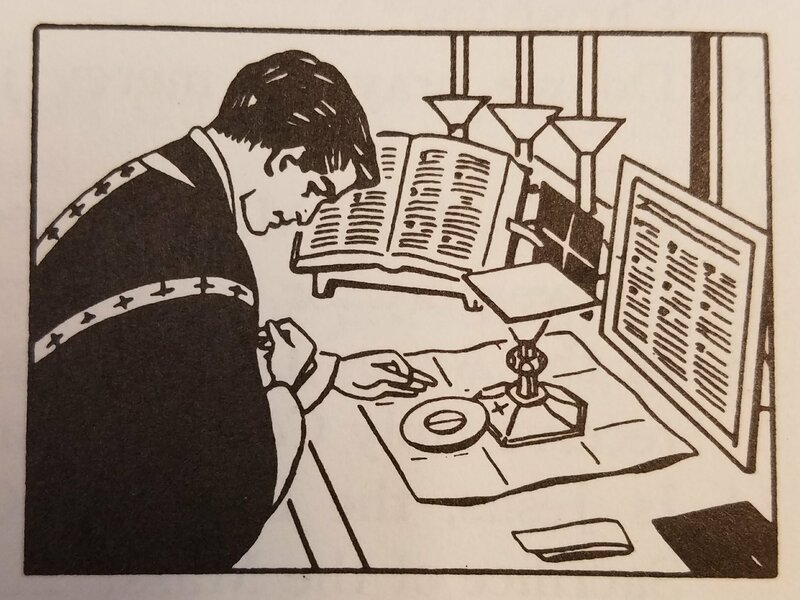 The apostolicity of the Church receives additional proof from the fact that today it still administers the very same seven sacraments administered by the Apostles. Non-Catholic churches have abandoned most of the sacraments, but the Catholic Church preserves and administers them all. Among the sacraments thus preserved are (1) Confirmation, and (2) Extreme Unction. St. Peter and St. John administered the first (Acts 8:14-17). St. James wrote about the second (Jas. 5:14,15). Why is the Church catholic or universal? –The Catholic Church is catholic or universal because, destined to last for all time, it never fails to fulfill the divine commandment to teach all nations all the truths revealed by God.“You shall receive power when the Holy Spirit comes upon you, and you shall be witnesses for me in Jerusalem and in all Judea and Samaria and even to the very ends of the earth” (Acts 1:8). The very name of the Church is Catholic, that is, universal. Even its critics admit that it is catholic. It has existed in all ages since the time of Christ, and teaches all peoples of every nation the same faith.It was St. Ignatius (50-107 A.D.) appointed Bishop of Antioch by Saint Peter, who first used the Greek word Katholicos, meaning “universal,” when referring to the Church founded by Christ; this he did in order to distinguish the True Church, already being preached throughout the world, from heretical churches that had arisen.In the fourth century certain sectarians protested against the True Church, yet still called themselves Christians. And so Catholics began to call themselves “Catholic.” In that same century St. Augustine said: “All heretics wish to call themselves Catholics; yet if you ask any of them to direct you to a Catholic church, he will not direct you to his own!”Wherever we go, whether in Europe, America, Africa, Asia, or Australia, we shall find the Catholic Church established. Everywhere it teaches the same doctrines taught in the United States; everywhere it is ruled by the same Head recognized in the United States: the Pope. When we say the Church is Catholic or universal, we understand that wherever it exists it must have the mark of unity. Otherwise it would not be the same body, but many separate bodies. Some heretical churches have branches in different countries, but they are really different bodies, because they change doctrines under different conditions. The Church everywhere teaches all the doctrines that Christ commanded His Apostles to teach.In the Catholic Church is fulfilled the prophecy of Malachy: “From the rising of the sun to the going down, my name is great among the Gentiles, and in every place there is sacrifice, and there is offered to my name a clean oblation; for my name is great among the Gentiles, saith the Lord of Hosts” (Mal. 1:11). The True Church must be so organized that it can admit all men into its communion. This the Catholic Church does. Christ founded the Church for all men, not only for a selected few, He died for all men, and wishes the fruits of His death to do good to all men. At present only the Catholic Church is to be found all over the world, ministering to all races and peoples, to all classes of the population, poor or rich, wise or ignorant, saint or sinner. The Catholic Church is the only Church for Everyman.Most denominations are national; all are localized. For example: in Germany the Kaiser used to be the head of the Lutheran Church; in Russia the Czar used to be head of the Russian Church. The Queen of England is head of the Anglican Church. Why is the Catholic Church apostolic? –The Catholic Church is apostolic because it was founded by Christ on the Apostles, and, according to His divine will, has always been governed by their lawful successors.Apostolicity is easily proved by the facts of history. If a church cannot trace back its history lawfully in an unbroken line step by step to the Apostles, it is not the True Church. Pope Pius XII, our present Pope, is the direct successor of St. Peter.He is the lawful successor of the Pope who preceded him; and thus each Pope lawfully succeeded the one before him, until we reach St. Peter, the first Pope, chosen by Christ Himself. All the sees founded by the Apostles perished or were interrupted, except the See of Peter alone. Where Peter is, there is the True Church founded by Our Lord.Those denominations that broke away from the Church thus lost their connection with the Apostles. They were all begun by individuals who could never have had any authority from either Christ or the Apostles. Most of them came some 1500 years too late. Non-Catholic denominations claim that they did not begin new churches, but merely “reformed” the old one. In answer we ask, Did the True Church exist at the time of the founding of these new churches, or not?If it did not, then Christ’s promise to be with His Church always had failed; His Church had died, and no human reform could possibly have resurrected it. If it did exist, then those who invented new doctrines were not reforming it, but founding new churches. In the same way, the Church derives all its holy orders, doctrines, and mission from the Apostles. It is “built upon the foundation of the Apostles,” of which Christ is the corner-stone (Eph. 2:20). It holds intact the doctrineand traditions of the Apostles, to whom Christ gave authority to teach.St. Paul says: “Even if we or an angel from heaven should preach a gospel to you other than that which we have preached to you, let him be anathema!” (Gal. 1:8). A church which at any time denies an apostolic doctrine, discards the sacrament of Holy Orders, or breaks away from obedience to the Pope, ceases to be apostolic. It becomes a dead branch broken off from the parent vine which is Christ Himself: “I am the vine: you are the branches” (John 15:5). That all religions are the same. The Catholic Church is One, because it has one Divine Founder, God Himself, Who cannot be divided. All its members hear and obey the voice of their Shepherd. The Catholic Church is Holy, because it imitates its Holy Founder, the Incarnate Son of God. Its members strive for holiness, aided by divine sacraments instituted by Christ Himself. Why is the Catholic Church one? –The Catholic Church is one because all its members, according to the will of Christ, profess the same faith, have the same sacrifice and sacraments, and are united under one and the same visible head, the Pope. They have unity in doctrine, worship, and government. They have “One Lord, one Faith, one Baptism.” There has never been any other society, religion, or government whose members are so closely united.If a kingdom is divided against itself, that kingdom cannot stand” (Mark 3:24). “Holy Father, keep in thy name those whom thou hast given me, that they may be one even as we are” (John 17: 11). There are about 425 million Catholics united in doctrine. This unity is evident and admitted by all. All Catholics every where believe each and every article of faith proclaimed by the Church. Wherever a Catholic goes throughout the world, he will find his home in the Catholic Church. There he will find his brethren in Christ all believing as he does. If he deliberately denies even one article of faith of the Church, he ceases to belong to it.International Eucharistic Congresses, held in different countries, in different parts of the world, every other year, are a good proof of the unity of the Church. In such Congresses the faithful from all nations-African, American, -Australian, Chinese, English, Filipino, French, German, Indian, Irish, Japanese, Russian, Spaniard,-one and all bow down in adoration of Our Lord Jesus Christ in the most Holy Eucharist. All Catholics today hold the same faith that Catholics in the past held.The same Gospel of peace that Jesus Christ preached in Judea, the same that St. Peter preached in Antioch and Rome, the same that St. Paul wrote to the Corinthians and the Ephesians, the same that apostles of all nations have been preaching for the last 1900 years, is preached today and taught in the Catholic Church throughout the world, from January to December-“Jesus Christ yesterday, and today, and the same forever” (Heb. 13:8). The Catholic Church is one in worship. All members make use of the same Holy Sacrifice of the Mass, and receive the same sacraments. Although rites vary, the essentials of worship laid down by Christ form the foundation of all. Certain ceremonies have been appointed by the Church, to show more clearly in outward form the spiritual significance of whatever act is being done, and to increase the devotion of those who are present or take part in tht religious acts. The ritual varies in various places, certain ancient rituals from the early days of the Church being preserved. But in general the Roman ritual, the one followed by the diocese of Rome, is the one followed. The change of ritual does not change the substance of the religious act, which is preserved in its entirety. All Catholics are united in government. Everywhere the faithful obey their pastors, the pastors obey the bishops, and the bishops obey the Pope. The Catholic Church is truly “one fold and one Shepherd”, its unity standing out unequalled in all history. Why is the Catholic Church holy? –The Catholic Church is holy because it was founded by Jesus Christ, who is all-holy, and because it teaches, according to the will of Christ, holy doctrines, and provides the means of leading a holy life, thereby giving holy members to every age.St. Peter called the Christians of his time “a chosen race, a royal priesthood, a holy nation” (1 Pet. 2:9). The Founder of the Catholic Church, Jesus Christ, is holy. The Church exhorts its children to imitate its Divine Founder. No founder of any other church is as holy as Jesus Christ, Son of God. And among the children of the Church we may mention as examples of holiness the canonized Saints. The Catholic Church teaches the highest and holiest doctrine ever presented to any people, a standard of perfection. The same precepts delivered to Moses on Mount Sinai, the same warnings uttered by the prophets in Judea, the same sublime lessons taught by Our Lord: these the Church teaches from year to year.The Church teaches its children to know, love, and serve God, and thus to become saints. It urges on them the truth: “What does it profit a man, if he gain the whole world, but suffer the loss of his own soul?” (Matt. 16:26). It exhorts them to imitate Christ. The Catholic Church provides powerful means for holiness, in prayer and the Sacraments. By the Sacraments a Catholic receives abundant graces. One who is faithful in the reception of the Sacraments will never fail to live a righteous life and die a happy death. Every Catholic is obliged to my his morning and night prayers, and to resort to prayer in every necessity and temptation, as well as to prayer of thanksgiving. He is required under pain of sin to hear Mass on Sundays and holydays of obligation. The Catholic Church produces holy members in its saints and martyrs. In every age and country the Church is the Mother of saints, martyrs, confessors, and holy men and women who live in Christ. We do not, however, maintain that all Catholics are holy. Unfortunately, some do not live up to the teachings of the Church; that will be their condemnation. We must remember that even among the Apostles there was one Judas. Our Lord Himself taught in the parable of the wheat and the cockle that the good and the bad will grow up side by side in His Church. The Catholic Church still has the gift of miracles. Christ promised His Church the gift of miracles, a sign of holiness. “He who believes in me, the works that I do, he also shall do; and greater than these he shall do” (John 14:12). Each holy soul proposed for canonization must have worked two miracles before beatification, and two more before canonization. We constantly read of miracles at Lourdes and other shrines. The cures at Lourdes are declared genuine by a board of physicians, many of whom are non-Catholic. The Catholic Church carries on numberless works of holiness. It is the great Mother of Mercy and Charity to the helpless. It instructs children in school, cares for the poor, the sick, the lepers, the deaf, blind, dumb, the old, the orphaned and abandoned. It engages in all kinds of missionary and charitable activity.